1) a shrine to the Madonna in their yard under half of a bathtub. 2) their garage is screened off and holds an entire living room set. 3) there is a bocce set somewhere in the yard. Being the youngest couple on the street, it is important that we learn each of our neighbors names in order to distinguish them. Their names range from “The Hobbits” to “The man we almost killed”. We also have “Army”, “Crazy Stick Lady”, and “Pink Truck Man”. By far though, my favorite neighbor is “Wet Suit Man”. When the town built the neighborhood back in the early 60’s they planted oak trees in each yard. These trees’ have blossomed and provide lovely shade on each property. Last summer, as my husband and I drove out of our neighborhood, we passed an elderly man who had just had one of these trees cut down after it had been damaged in a wind storm. From first appearances it seemed that he was trying to dig up some large roots. Except for one thing…he was wearing a WET SUIT. Nope, I kid you not. He was decked out from head to toe in a BodyGlove. AND IT WASN’T EVEN RAINING. None of this registered at first and we drove all the way to the end of the street before my husband and I turned to look at it other and at the same time said “Was he wearing a wetsuit?” Hence forth he has been known as WET SUIT MAN. A year later that large patch of dirt from where the tree once stood still exists. Weeds grew there during the fall and snow lightly fell during the holidays. Spring came and dandelions sprouted out of this large patch of dirt, but still no grass was grown. We had all but given up hope that this dirt patch would never know any other existence. That is until last night!! 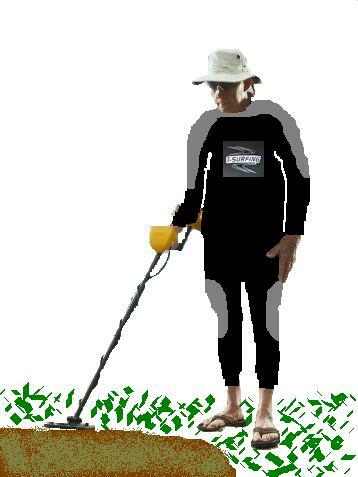 We headed out as a family to get some ice cream and as we passed, we noticed that Wet Suit man was at it again and this time he had a METAL DETECTOR hovering over the dirt patch. Hoooooray for buried treasure. Listen Lady, this isn’t the movie set for pirates of the Caribbean, the only thing you are going to find in that hole is an old sangwich, some leftover antipasto, and an old dish of gnocchi. Please take your crusty wet suit and NEVER put it on again while you prance around in public. For your visual pleasure, I have drawn the below representation of the event. Please note that this is only a dramatization and no animals were harmed in the making.